Since the Windows XP days Windows has had some burning capabilities built into it. I decided to experiment with this in Windows 10. I am going to burn a folder called docstosave. First, open up File Explorer. It’s usually pinned to your taskbar and looks like a yellow folder symbol. Find the files/folders you want to burn, then on the Ribbon at the top, click on the Share tab. If you don’t see any of this you might have it hidden. Just click on the drop-arrow shape in the right-hand corner of the menu system. Now you should see the Share tab and the Burn to disc option. 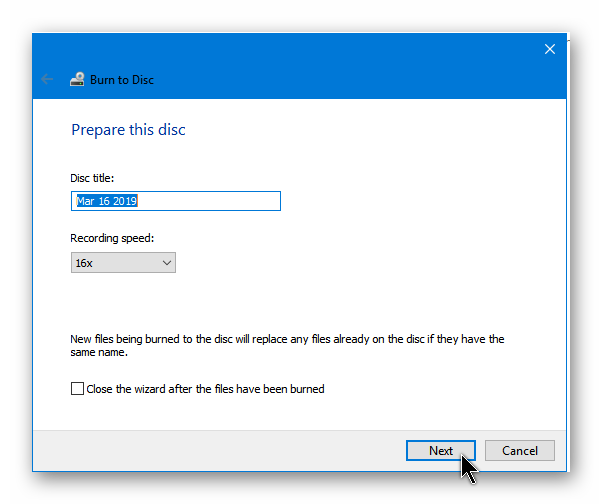 The first window that pops up asks you How do you want to use this disc?. In my case, I clicked on With a CD/DVD player. You can enter a title in the Disc title box, but I just left the date there. Another Explorer window opens and you’ll get a pop-up progress bar. 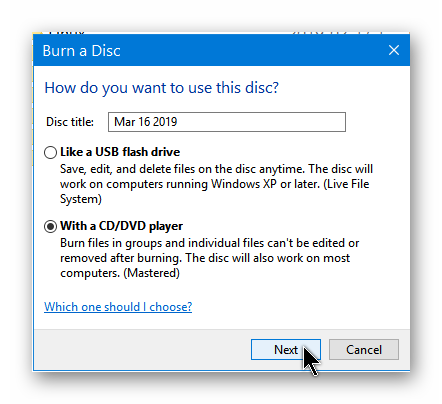 Then you’ll see your DVD burner selected and in the right-hand pane, you’ll see the folder you selected to burn that indicates that it is a shortcut. Keep in mind at this point that no burning has taken place yet. Down near the clock on the taskbar, I got a little symbol that looks like a CD and a drive. I think it’s just a files-to-burn reminder. I clicked on it and it simply vanished. The second time I tried burning this way, it didn’t appear at all. These files are only cached. So now, on to the burning. 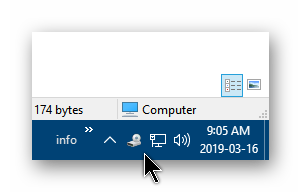 Across the top in this new File Explorer window, click on the Drive Tools tab, and click on the Finish burning button. In the window that pops up, change the Disc title if you want. You might want to change the Recording speed to a lower number if you are having problems burning, otherwise leave it as it is, then click on Next. And the burning begins. It doesn’t usually take that long. 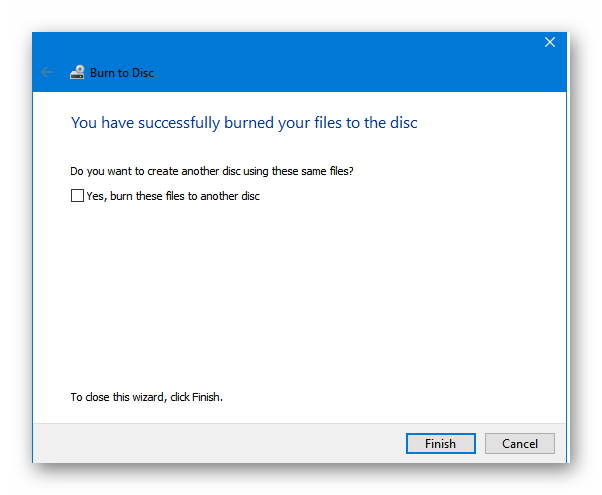 Then you’ll get a You have successfully burned your files to the disc window. Here you can burn another copy or just Finish. Now that I’ve done it, I don’t like it and probably will never use it again. 🙂 But if you are wary about downloading other burning software off the Internet and want to back up to a CD/DVD, I do recommend it for backup purposes. Any backup is better than none at all and it makes at least two copies– just my recommendation. 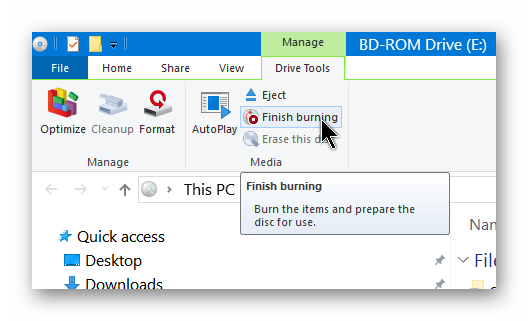 This works, but I usually just drag & drop files into CD Burner XP for my CD/DVD burning. I do the same thing with BurnAware.